Crow curiosities: Do crows collect shiny objects? The notion that corvids, especially magpies, have a special affinity for shiny object has been around for more than a century. In fact to refer to someone as a magpie is to describe them as someone who ‘compulsively collects or hoards small objects’. This idea is so old hat that it can feel a bit frivolous to even wonder if it’s true. The trouble with this bit of corvid whimsy, however, is that when we do investigate it, and scientists have, we find there’s no empirical evidence to support it. 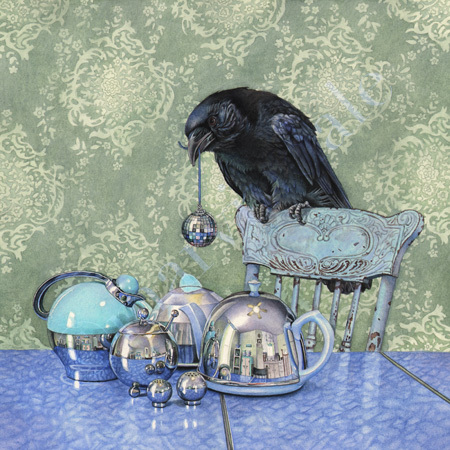 ‘Crow Collects’ by Cori Lee Marvin. For instance, one study presented both captive and free-living magpies piles of blue or shiny silver screws, rings, and pieces of tin foil near piles of food to which they had been previously habituated.1 They found that, rather than thieving and subsequently caching the gleaming objects, the birds were actually more nervous to take food than they had been previously. In the 64 conducted tests, only two instances of contact between a bird and an object were recorded. Experimental set-up for magpie study. Cornell crow expert Kevin McGowen, elaborates on this general conclusion, suggesting that perhaps the origin of this folklore is pet crows who are attracted to the objects of obvious value to their owner like coins, keys or jewelry. Speaking personally as someone who has spent countless hours observing hundreds of individual crows in the field, I can also attest to the fact I have never witnessed anything resembling this behavior. So there you have it, corvids do not, according to the best empirical evidence, show an attraction to, or are otherwise known to collect shiny objects. And yet I still hear anecdotes about this behavior that peak my curiosity. For instance, once or twice a year I’ll see a headline about crows thieving shiny stones at the expense of bereft family members. In Jewish culture, it’s tradition to leave a small stone atop a gravestone, as a way to honor the deceased and indicate that they’ve been visited. For whatever reason, particularly across Ireland, these stones occasionally go for joy rides in the mouths of crows. In Omagh, Patsy Kerlin who mounts headstones in his town’s graveyard recently told a local reporter that “It seems to be only the black shiny ones they take and a lot of them go missing.” Even in my own neck of the woods at the University of Washington one of the gardeners at the Urban Horticulture Center regaled John Marzluff and I with his story of how the crows regularly steal the shiny metal placards that identify the center’s plants. In science, we often like to say “the plural of anecdote is not data”. This is unequivocally true. But just because they’re not data doesn’t mean they’re meaningless either. I’m inclined to believe there’s more to these stories than random chance and I think they are worth exploring. Perhaps these stories emerge out of confirmation bias, meaning people tend to report theft with respect to shiny things more often because they’re looking to confirm a suspicion they already had. If so, it would be yet another fascinating example of the extent to which corvids have infiltrated our culture. Or perhaps this is the work of curious juveniles as has been suggested by my crow colleague Dr. Jennifer Cambell-Smith. If so, teasing out any evidence of discrimination or bias juveniles are using when selecting objects to explore could give us insight into how they learn about the world, or how our garbage is modifying that behavior. Or perhaps crows do like to carry off with glossy objects, but for textural, rather than visual reasons. At least some corvid species swallow small stones to aid in digestion and these stones are most often partially smoothed.2 These ‘grit stones’, however, are considerably smaller (on average only 2.9 mm) than I imagine grave stones are, so perhaps this behavior is evidence of poor grit stone selection among naive birds. Or maybe it’s none of the above, we simply cannot say. Which, for me, is exactly why I find these anecdotes so interesting. While we can rule out that this behavior isn’t a manifestation of corvids’ love for bling, we can’t exactly explain this behavior either. It’s yet another item on the shelf along with thieving golf balls and wiper blades where we can’t do much more than offer an educated guess. So while I’m quick to clarify that crows are not attracted to shiny objects, I’m not dismissive of these anecdotes either. My friend and colleague David Craig likes to say that every bird has a story, and citizen science is part of sharing that story. In my book, the story of corvids and their light fingered behavior seems an ideal project for the crow minded bird nerd. Shepard, T. V, Lea, S. E. G., and Hempel de Ibarra, N. 2014. Thieving magpie’? No evidence for attraction to shiny objects. Animal Cognition 18: 393-397. Great post! 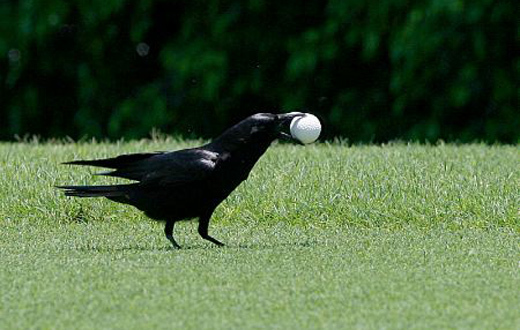 I’ve come across a lot of anecdotal accounts regarding corvids and coins, bottle caps, and golf balls, so I was surprised a while back when I heard about these findings. Thanks for sharing this! During an especially hard New England winter that lasted over-long, my mom fed a crow family of four bits of bread with peanut butter. She said they would come to the back door or window every day at about the same time (11:00 am), and my mom would either bring out, or lob out the window (on especially nasty days she would just open the window) the bread and Jiff. She said there were four crows – two adults and two juvenile crows which she guessed by the noticeable size disparity. They would eat the peanut butter and fly away with the bread chunks. When the winter began to lessen it’s grip, she noticed a pile of beer bottle tops, tabs from soda cans, and round, shiny stones piled in the area of the backyard where she left the food for the crows. At first she thought it was kids playing a joke and she sent my dad to pick up the trash. Then she thought it was my dad drinking beer in the backyard and leaving tops outside. Then she began to suspect it was the crows’ way of payment or thanks because she began to take more careful notice and observed that on a daily basis only four objects would show up. She surmised they were “gifts” – one from each crow in the little crow unkindness she had been feeding! Yes the crows steal my large shiny stones. Caught in the act several times. Hello my english bad sorry. Good about science can have many hypothesis. Why no hypothesis crows who experience humans see humans wear shiny or like something and crow like to make bribe or present for human. So experiment crow maybe could know food provided from humans? So when experiment fed and shiny thing there and they do not take ,they want to maybe not “steal” objects from human who give food? maybe opposit – want to give shiny or other thing they think human like? i dont know exact experiment setup so i just speculate. it could be not inherant but learned from experiance with human so maybe just some crow have interest in objects to give present or bribe? How about Super Glue? Just a thought . . . . I just watched a crow take 3 silver metallic hot wheels cars out of our yard. We had about 30 in the sun and he or she took only silver bottomed ones. There is something to this for sure. I’m sorry to hear that, Peggy. I wish I could offer you a confirmed explanation! Perhaps and maybe this is a gargantuan leap, but perhaps the crows only value shiny things that humans appear to value. Making the attraction to shiny things, not innate but instead social. No, I think it’s totally possible! Crows learn to explore things we like because very often it turns out to be food.